Trouble in corporate paradise. Are CLOs the new CDOs? It couldn’t happen again, could it? The financial crisis continues to cast a long shadow when it comes to global growth, debt and monetary policy. In an enlightening piece last week, John Authers, writing for Bloomberg, documents that the so-called decade of deleveraging that was supposed to follow the 2008 crisis didn’t really happen, both globally and in the US. While American banks have trimmed their balance sheets, European banks have not. American households have tried to cut back but with limited effect. The level of total debt from all sources (household, government and corporate) in China, France and a panoply of emerging market countries has grown substantially over the last decade. But the biggest take away from the piece was Authers’s comments on the big rise in U.S. corporate leverage. 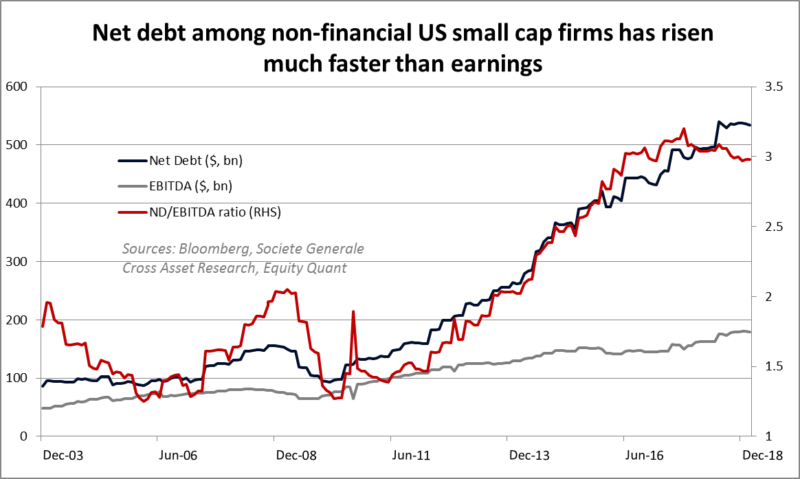 Meanwhile, smaller companies in the U.S. have also massively increased their leverage, blowing up their net debt to profits ratios. Figure 1 illustrates Authers’s point that debt is rising faster than can be justified by strong earnings. Figure 1 shows net debt and earnings before tax, depreciation and amortization among non-financial firms in the Russell 2000 index. But there is something going on in the corner of the corporate loans market that merits attention. The catalyst for the 2007/8 financial crisis was the over-extension of sub-prime US residential mortgages which were pooled, sliced and diced, then sold onto to investors and investment banks. These products were called Collateralised Debt Obligations (CDOs), a form of structured finance or asset-backed security. When the underlying cash flows failed – i.e. when poor US borrowers defaulted on their payments as interest rates increased – those products failed, exposing investors and banks to huge, system-corrupting losses. That model of loan origination and restructuring has returned, but this time to the corporate loan space. 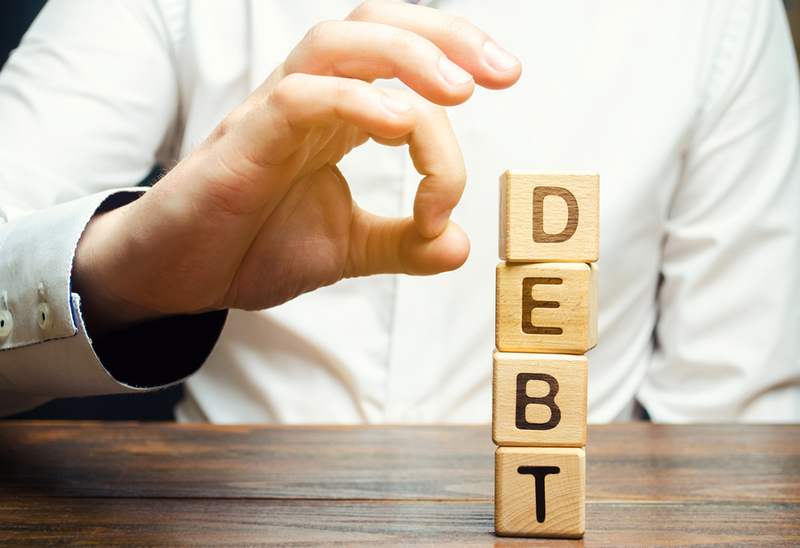 Managers of so-called Collateral Loan Obligations (CLOs) buy a collection of leverage loans that banks have issued to companies that typically have a poor credit score, low interest coverage and significant existing amounts of debt and slice them into tranches according to their risk. Investors can then buy these tranches from a CLO manager on behalf of their clients according to their appetite for risk and expectations of return. The CLO manager receives cash flows from the bundle of loans as corporates repay their debts. She then pays out these cash flows to the tranches according to a pecking order. 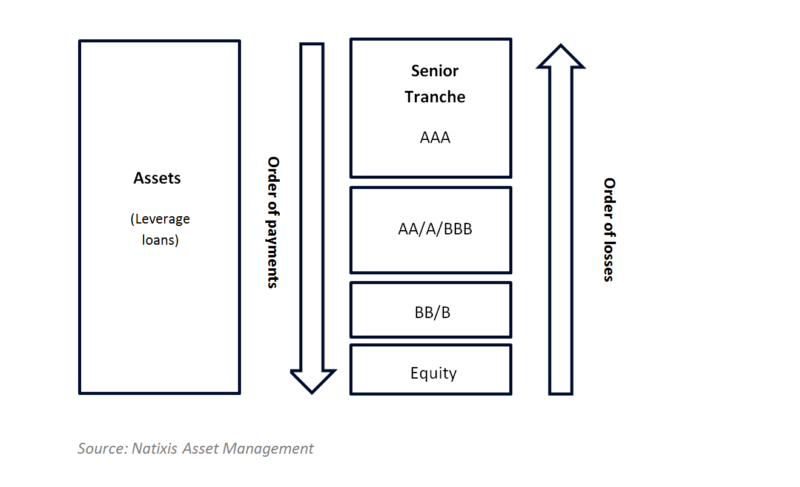 Investors that hold the senior trance (AAA) get paid first and suffer losses last; in return for this privilege they get paid a lower rate of return. Riskier trances (BB or B) get paid last and suffer losses from default first; if they get paid at all, their returns tend to be greater. Figure 2 illustrates. Figure 2 shows the structure of a collateralised loan obligation (CLO). The CLO manager uses the cash flows from the bundle of leverage loans to pay investors a rate of return determined by the tranche in which they have invested. Since investors in the senior tranche get paid first and suffer losses last, they bear the least risk in the structure and therefore get paid a lower return. If borrowers who have taken leverage loans default, it is possible for investors in the CLO to lose all of their investment in the product. CLOs are not available to retail clients. Leverage loans are typically used to fund mergers and acquisitions (M&A), and in an environment of inflated valuations – based on inflated expectations of future profits – this can create serious problems for investors in CLOs if the implied Goodwill from these M&A transactions does not materialise in future profit streams. On top of this, it has been reported that up to 80% of leverage loans that are bundled into these CLOs are ‘covenant-lite’. This means that lenders are likely to be far back in the queue for assets if the borrower defaults; in some cases, the leverage lender has found no recourse to the lender’s assets. It is a borrower’s market because there is huge demand from investors searching for yield in an era where cheap liquidity has suppressed asset returns. Investors therefore like CLOs, despite their provenance, because they have proven to generate impressive returns. Rates of return are typically tied to LIBOR plus a spread reflecting the risk. Compared to US high yield, which returned just 1% in the year to November 2018 on a total return basis, leverage loans were pushing 4% and were one of the best performing asset classes overall. Supposing corporate defaults stay low (they are currently below 3%), leverage loans will continue to do well, fuelling demand for what many might consider as junk. Perversely, as the returns are tied to LIBOR, the asset class does better in a rate-rising environment, where you tend to find corporate defaults rising. It could all end in tears. 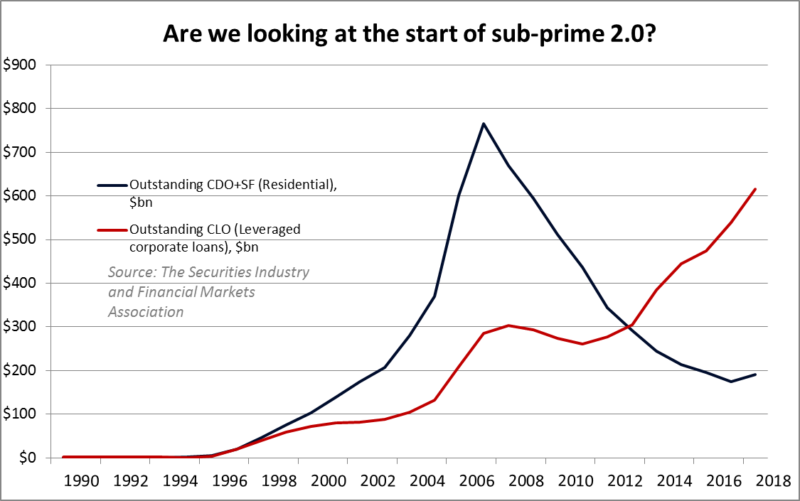 Figure 3 shows how, according to SIMFA, the dollar amount of outstanding CLOs in the U.S. is approaching levels that we saw a decade ago with CDOs and structured finance products for the American sub-prime mortgage market. Figure 3 shows the outstanding quantity in dollar-billions of collateralised debt obligations and structured finance products pertaining to residential loans, which characterised the sub-prime mortgage crisis in the 2000s (blue line). The red line is the outstanding quantity of collateralised loan obligations, consisting of bundles of leverage loans to corporations. If it does all end in tears, is there a broader risk to the financial system a la 2008? It appears that SIFIs – systemically important financial institutions, or big banks – have largely avoided the CLO market, but we cannot preclude that they or their subsidiaries have been getting involved through shadow banking techniques that are off balance-sheet. Alternatively, banks may simply be arranging leverage loans or originating them with the intention to sell them on to CLO investors. Given the persistently low profitability rates of SIFIs, the temptation for banks to get involved is there. However, the application of Basel III and tougher risk-weighting rules for capital requirements should act as a strong deterrent. It is therefore institutional investors that may be more likely to get burned, either due to direct exposure or indirect exposure through the money markets. It might be fine when the default rate is 3%. That was arguably true in 2006 in the US mortgage market. Trouble may come when interest rates and wages rise, earnings fall and over-leveraged borrowers drown in a rising tide of debt.